Craft Supplies In Your Trash – Get Them Out and Use Them! 24th February 2018 by Gilly·Comments Off on Craft Supplies In Your Trash – Get Them Out and Use Them! Craft supplies can be mega expensive when you add up the cost of a haul. I know because I am a craft supplies junkie! But in recent years, I have leaned more and more towards finding my craft supplies in the recycling bin. Do you ever look at a jar, box or bottle and think - this is way too pretty to throw away - what can I make with it? That\'s what happened when I was washing this empty plastic honey bottle ready to put in the blue bin. No, I cried - this will become something else! To see the full tutorial video click here to go to my YouTube channel. Although I used a few other craft supplies that I had bought, the main base for this project was junk - I love a challenge! Plastic isn't easy to dress up. It's cheap looking and lightweight - so my challenge was to take the plastic look away while working with the lovely shape of the squeezy honey bottle. And I also needed to give it a more solid feel. Using the Starlights Metallic paints from Imagination Crafts helped to take away the plastic look and give the bottle a golden glow which I contrasted with a dark emerald color. Starlights metallic paints are one of my most loved craft supplies. For this project, I have sponged the paints on to get a lovely textured feel to take away the smoothness of the plastic bottle. It kind of masks the fact that the incense holder was actually once a squeezy plastic honey container. These paints are metallic and have a wonderful glow to them in certain light - especially sunlight - that I have not seen in other paints. I was especially pleased with the way they covered the plastic. If you want to find these paints and you live in the UK - visit the Keep On Crafting Website - although I think owner Mandy does ship products worldwide. If you live in the US or anywhere else served by Amazon.com and you don't want to ship in from the UK, have a look in my Amazon store - Rainbow Lane where you will find a set of Americana Dazzling Metallic Paints. You will also find a selection of craft brads to use like I did in the video. I have not used these paints but they seem to be the closest I can find to Starlight paints and I would love to try them out - they sound wonderful. If you want to know how I made this lightweight bottle heavier so it wouldn\'t knock over easily, watch my video on how I did the project from start to finish. My videos are shot from an angle where you can clearly see everything I am doing. And, I try to cut out as much non-essential footage as possible in the final edit as I know time is valuable. You can find the video here on my YouTube channel. It\'s an short easy to follow film and I hope it inspires you to look for your craft supplies in the trash! 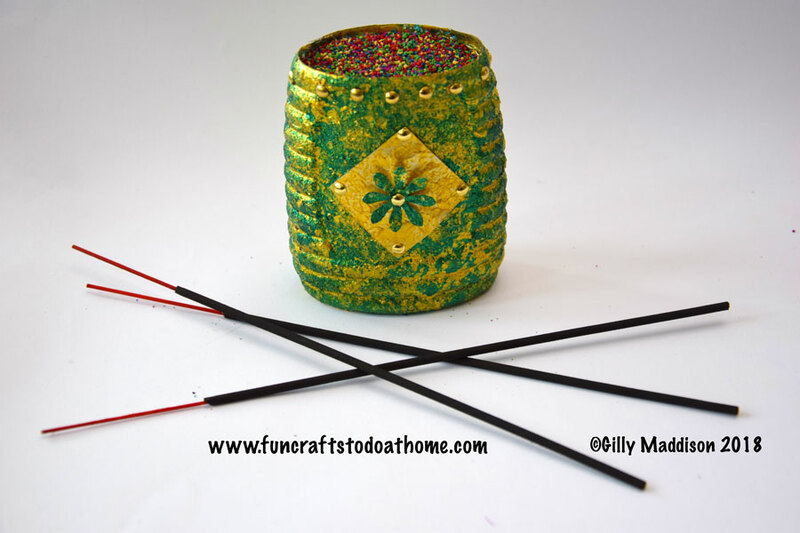 Previous Previous post: Metal Recycling – Make A Cool Candle Holder From Tuna and Pop Cans! Next Next post: Craft With Toilet Paper Rolls – You’ll Never Believe The Results!